Most journal only allow to use p values less than .01 and .05. I saw there are other journals allow p value less than .10. Could anyone can inform me is it justified to use p value less than .10? How to use HistCite software to calculate Local Citation Scores (LCS)? Answers from research community will be appreciated. Do you think telecommunication is the future of the world? How it will contribute in the next generation's lifestyle? Good answers will be appreciated. How patents matter a lot in publication? 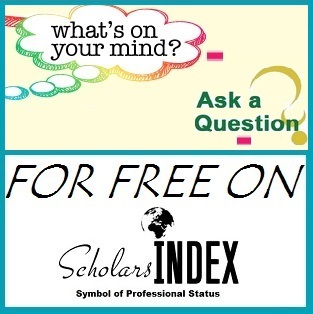 Do you find Scholars Index useful and innovative? Members are requested to express their feelings and provide feedback by answering this question. I hope you will enjoy your new social networking experience. Can we live for ever? When can I have a robot butler? How do we beat bacteria? What's at the bottom of a black hole? What's at the bottom of the ocean?